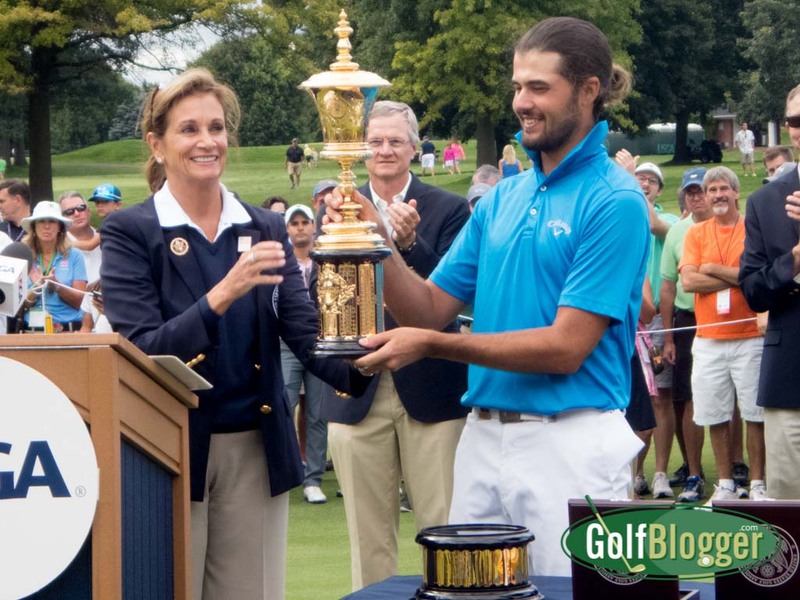 USGA President Diana Murphy presents the Havemeyer Trophy to Curtis Luck, winner of the 2016 US Amateur. Curtis Luck won the 2016 US Amateur 6 and 4 over Brad Dalke at Oakland Hills Country Club. The finals of the US Amateur are over 36 holes, so Luck closed out Dalke on the 32nd hole. The match was All Square after 18. Following lunch, however, Luck went on a tear, winning eight straight to go 7 Up on the 27th hole of the day. Dalke fought back to win the next two, but it was really too little, too late. The eight straight winning holes was the most in US Amateur competition. In addition to having his name on the Havemeyer Trophy and a gold medal, Luck also receives an exemption from local and sectional qualifying for the next U.S. Open, an exemption from qualifying for the next 10 U.S. Amateurs, an exemption from qualifying for the next British Open Championship and a likely invitation to the next Masters Tournament. Luck was considering turning professional, but now says that he will forgo that to take advantage of the opportunities afforded by his US Amateur win.